Neil Young and Promise of the Year have been tearing up the stage at each venue they hit on this Rebel Content Tour. He’s another positive review from Steve Israel at the Times Herald Record. He calls the show “Riveting” that was held July 18 at Bethel Woods Center for the Arts in Bethel, New York. 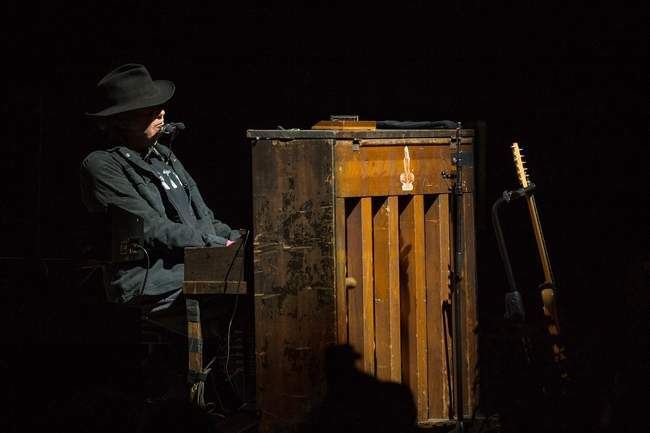 Read on: “About 45 minutes into his riveting three-hour show at Bethel Woods Center for the Arts Friday night, Neil Young talked about the first time he played the site of the 1969 Woodstock festival, 46 years ago, with Crosby, Stills, Nash and Young. Back then, the sloping hills of Max Yasgur’s dairy farm were a muddy mess, blanketed with 450,000 young, sweaty long-hairs, many of whom got in for free. “On Friday, Young stood on the stage of the plush pavilion, where the top ticket cost $204.50, on grounds where the crowd of some 13,000 – many with gray hair – could wander on manicured lawns amid the flowing streams and blue stone walls of the arts center. “Then, as if this relentless warrior of musical and social change couldn’t help himself, he slyly suggested something radical. And, he said, the protest tunes from the new “The Monsanto Years” album may have paled next to the classics, substituting clunky platitudes for timeless poetics. But Young and Promise of the Real played them with a physical and emotional ferocity that often made the cliches vanish into the sweet summer air.